There has been a gaping hole in my experience of live Christian music up till now. 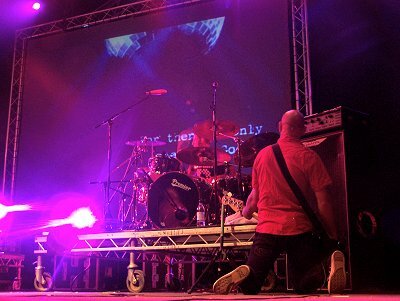 Since the early 70s the Greenbelt Festival has established itself as THE event of the year when it comes to live Christian music in the UK. Deciding it was about time I witnessed this festival for myself, I headed towards Cheltenham to see Delirious? perform at the final day of Greenbelt. Whilst on route I received a call from Jon and we arranged to rendez vous at the Air Balloon Pub, about 20 minutes outside of Cheltenham where he and his friend Jamie were stopping for lunch. Once there Jon filled me in on the band's recent tour to Asia, an eventful trip with numerous stories ranging from bomb-threats to police raids. A little while later (and several trips around Gloucestershire's roundabouts) the three of us arrived in convoy at Cheltenham Racecourse. Making our way through the festival site, we located 'mainstage' and the glamorous 'backstage area'. Said place is a fenced off area immediately behind 'mainstage' where technical crews and artists 'hang out'. Yep, this is the place to be. 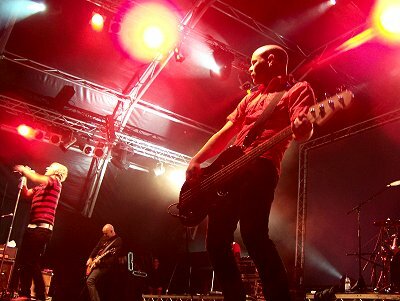 You'll be needing your red 'mainstage pass' (see below) to get past the yellow-jacketed security personnel and into this exclusive, no doubt luxourius, part of the festival. Or so I thought. On arrival it appears that dressing rooms at Greenbelt are not quite what you may expect. In fact they're just small portacabins with a couple of chairs and a table (see above). So disappointing. 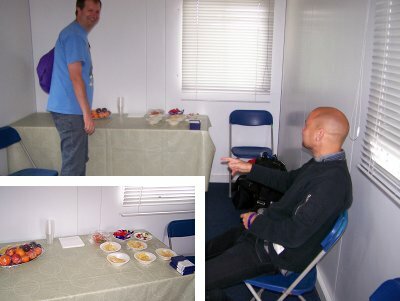 Jon was particularly keen for me to take photographic evidence of the provisions that had been laid out for the band. Yes I think it's fair to say that this band have some outlandish demands on their rider. A bowl of crisps - EACH, and a whole basket of fruit. Nothing but the best for these superstars. Anyway, enough about the backstage facilities. Rumour had it that there was a 'contributors patio' which was reserved for holders of the 'purple pass' with provisions for contributors. 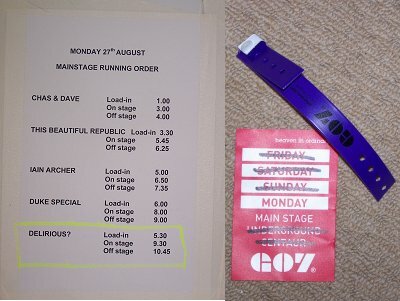 I followed Jon and Jamie through the throng of people gathered by mainstage to watch Chas & Dave as we weaved our way towards this alleged nirvana, all the while feeling slightly guilty that I would be passing myself off as a 'contributor'. It turns out that Jon is a pretty popular guy. We could barely walk a few steps without him passing somebody he knew and stopping for a chat. Eventually we arrived at our destination, which was also slightly less glamorous than it sounded but did have a very pleasant man offering tea and coffee. After most of Littlehampton had said hello to Jon, we departed on a walk to the far side of the site guided by Mr Andy Hutch (lights and video genius) to visit the tented village he was sharing with another group of people who all seemed to know Jon (he really is Mr Popular). Anyway, in the interest of not getting completely bogged down in irrelevant details (and before I start writing about festival toilets), I'll just skip the next few hours of general browsing of the festival. The remaining Delirious? band members had by now arrived, and they were due to do 'press' backstage, so I wondered off in search of some music. Before long I discovered a tent where Retrofect were playing. For those not in the know, there is a d: connection with this band, Jon's brother Ben is the drummer and Martin's nephew Tom plays guitar. I noted Mum & Dad Thatcher proudly watching their youngest, and Jon also had a quick listen. Anyway... some more time passed [skip to the interesting bit] and at last it was 9:30pm and time for Delirious? to go on stage. 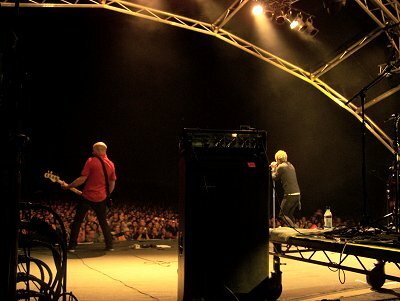 I stood at the back of the stage watching as the band walked on and rocked straight into new song 'God Is Smiling'. The view from on stage was stunning. I could see endless faces stretching out into the darkness like a vast sea, all focused on the 5 guys on stage just a few meters away from me. 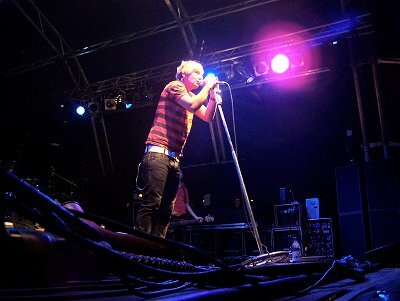 Armed with a camera and my red pass I walked round to where the pit between stage and crowd was located. The yellow-jackets had other ideas. 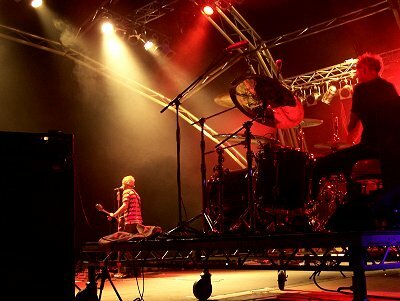 Apparently it was fine for me to stand within spitting distance of Stew and his drum kit on stage, but going in front of the stage was a no-no even with a red pass. After some careful negotiation they reluctantly agreed to let me in, on the condition that I wore ear plugs "for health and safety reasons". Their concern for my hearing was touching but it occurred to me that standing in front of a band with yellow and pink blobs of foam stuck in your ears was about as big an insult as you can pay any band. So I graciously accepted the ear plugs I was offered by the yellow-jacket, shoved them in my pocket and entered the pit to start taking photos. A tap on my shoulder and apparently yellow-jacket had noticed I wasn't wearing my life-protecting ear devices and was non too pleased. Reluctantly I stuck them in my ears and hoped the band wouldn't notice. There were more photographers in the pit than I've ever seen at a Delirious? concert, but being a Christian festival there was no jostling or pushing. Just polite excuse-me-pleases and envious looks from me that everyone else had professional looking gear with lenses longer than your forearm. One yellow-jacket took one look at my less than impressive camera and whispered in my ear (well it was more of a shout to be heard through my ear plugs) "are you sure you're meant to be here?". I scowled and moved to the other side of the pit. Before I knew it Delirious? were coming back on stage for their final song encore. I made my way round the back of the stage again and up the steps to watch from the side of stage as they received their applause and took their bow. It was an impressive sight. 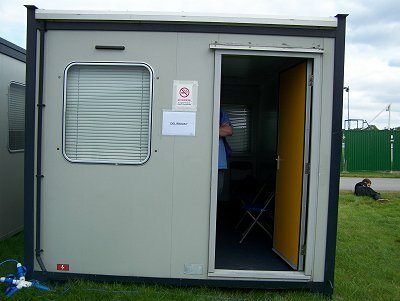 Back in the portacabin dressing room Tim was relieved they'd done ok without a sound check and everyone seemed happy. Now to negotiate the Gloucestershire countryside for the journey home.